Luka and her grandmother Tutu are best friends until Luka shows her disappointment at the traditional Hawaiian quilt that Tutu makes for her. Tutu is hurt, Luka is upset, and things just aren't the same anymore. But when Lei Day comes, the two set aside there differences to enjoy the holiday. "Guback's storytelling proves as affable as her bright, intricate cut-paper collages." -- Publishers Weekly. 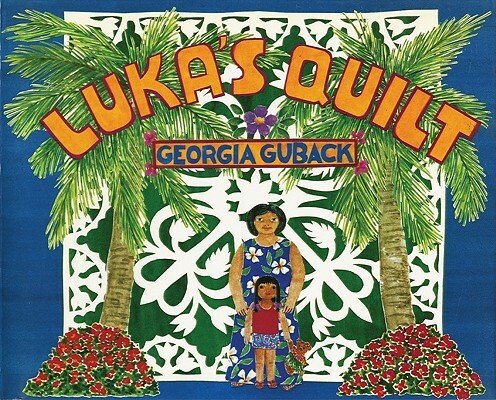 Georgia Guback is the author-artist of The Carolers. She studied art at the San Francisco Art Institute, Chouinard Art Institute in Los Angeles, and other places as well. She studied film at the University of California at Los Angeles and the University of California at Irvine. She was also an English major at Iowa Wesleyan College. She was born in New Jersey and has lived in New York, Connecticut, Arizona, and Canada. Ms. Guback now lives in Berkeley, California, and has one married daughter, who lives in Texas.